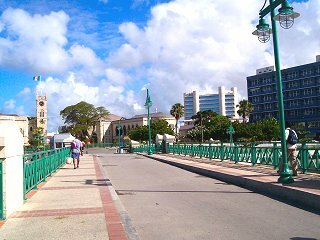 The Chamberlain Bridge is located in the heart of the capital city of Bridgetown. The bridge was originally a swing bridge constructed between 1865 and 1872 and was named after Joseph Chamberlain, the British Secretary of State for the Colonies. The Chamberlain Bridge separates the inner and outer basins of the Careenage which is a safe harbour for many catamarans, fishing boats and other pleasure craft. 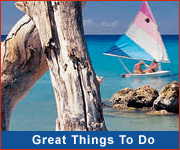 Most craft remain in the outer basin except during hurricanes and high seas when several are moved to the inner basin. To the west of the Chamberlain Bridge is the Bridgetown boardwalk, a wooden boardwalk that runs along the waterfront. It's well worth a stroll. 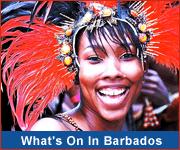 At the southern end of the Bridge is the Independence Arch which commemorates Barbados' independence from Britain. Also at this end is the Independence Square park which is a lovely place to relax and watch the boats coming in and out of the careenage. Looking across the Chamberlain Bridge from this vantage point you will also see the lovely historic Parliament Buildings. In 2006 the old swing bridge, which was manually operated, was replaced with a modern lift bridge.